Katherine Regnier is the first recipient of the Ravi Maithel Find A Way award. This award honours residents of Saskatchewan and Alberta who exemplify Ravi Maithel’s perseverance and success in finding a way to accomplish goals that others think are impossible. Katherine was recognized for the years she spent building her company and creating value for major accounts such as TELUS, Rogers, and Jackson Hewitt. In the last year, Katherine attracted major investment and grew the team to over 35 employees in both Saskatoon and Toronto. Ravi’s words of encouragement were “find a way”. His message to everyone was: “Never give up, never take no for an answer, and despite any hurdles there is always a way of achieving your goals.” He believed in always aspiring to raise the bar. Katherine amplifies that message with her passion and hard work. She has gone through the many ups and downs of starting and growing a business and was self-financed through the majority of it. There were many times when the majority of people, if in her shoes, would have given up, however, Katherine always found a way to keep moving forward. She is a courageous leader, a business guru and an inspiration to all who meet her. This message has been at the heart of herself and of Coconut, no excuses just Find-A-Way. She has fostered a company culture where employees are empowered, thrive and go beyond for each other and their customers. Katherine also gives back to the tech community, she mentors countless other start-up companies and is a founding board director for the newly formed Co.Labs – Saskatchewan’s first business incubator. 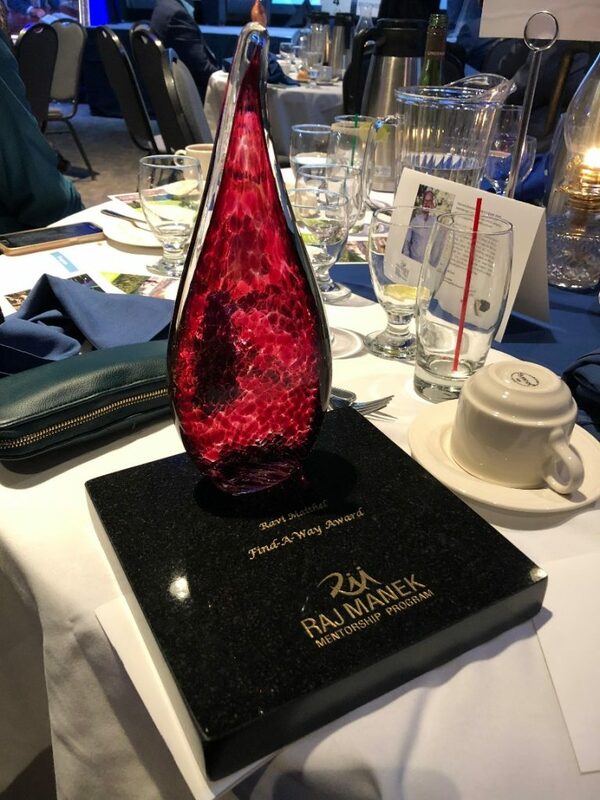 The Ravi Maithel Find A Way award, is named after Ravi Maithel who served the Raj Manek Foundation and the Raj Manek Mentorship Program since 1997. He worked tirelessly to serve on the Board of Directors until his passing on June 8th, 2016. Ravi was also the Co-Founder of the Raj Manek Mentorship Program, which provides business coaching, mentorship, and complementary tools to small and medium-sized entrepreneurs who demonstrate a strong desire and readiness for personal and professional growth in Saskatchewan and Alberta.